Linlithgow Young People’s Project has become part of the fabric of the town over the past 25 years. 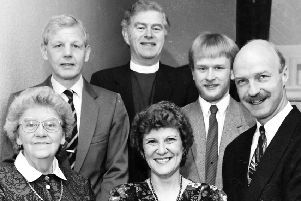 Volunteers at the youth group have seen “multiple generations” passing through its doors, which have had a permanent base on Linlithgow High Street for the past 15 years. The work they have been involved with has ranged from organising day trips to working with the local high school pupils to encourage them to think about their future paths and chosen careers. Pamela Mellstrom has been a volunteer since 2001 and she said it’s important for the group to celebrate reaching such a big milestone. She said there’s not a specific type of person that this group is tailored for, and that anyone can benefit from it on some level. The group is currently working with fourth and fifth year pupils at Linlithgow Academy on a year long personal development project and she said this is the most ambitious task they have ever taken on as usually the longest projects last six to eight weeks. Linlithgow Young People’s Project was initially set up as a Monday night youth club at St Michael’s Church Hall and grew out of a general feeling in the town that the young people needed something to do. She said those initial years left a “lasting legacy” that something had begun. Although it was not until 2001 that the project opened its first High Street property at 29 the Vennel, at that time known as the ‘PowerStation’, there was a lot of positive steps being taken towards establishing Linlithgow Young People’s Project as it is today. She said: “Volunteers were involved and the churches and wider community had come together to support this work. “Over the years the project has changed staff, volunteers, names of activities and ways of working as well as developing working partnerships within West Lothian Council and other youth work networks. “Yet the initial prompt that was our reason for beginning ‘to do something’ remains the driving force behind the work we do today. “LYPP exists to ‘bring hope to the young people of Linlithgow and surrounding areas’. The team has arranged a fundraising gala dinner to celebrate the past 25 years, which they say have been a “privilege”. The event at Linlithgow Burgh Halls on Friday, February 26 will be an opportunity for up to 120 people to gather in celebration of the work that has been achieved over the years and to look forward to the future. Tickets which will include dinner, a prize auction and raffle as well as dancing and live music from ‘The Copyrights’ are on sale for £40 per person. To reserve a ticket or to get more informationcall 01506 202610.